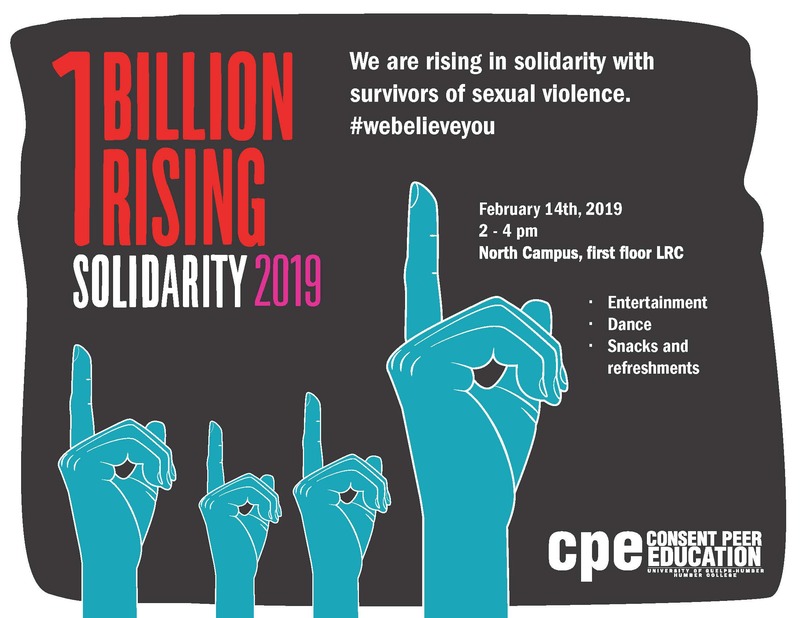 The Consent Peer Education Program is hosting an event called “One Billion Rising” on Thursday, February 14 in the LRC main concourse at North Campus. The event will consist of messages from our Consent Peer Educators, light refreshments, dance workshop, healthy relationships activities, resource tables, and more. One Billion Rising is a global campaign that is entering its 7th year, and works towards freeing those who identify as female from sexual violence and gender-based violence. This year, One Billion Rising is focusing on freeing women from oppressive systems that exist within the political, economic, cultural, and ideological spheres through dance and mobilization. This event calls on us to “Rise, Resist, and Unite” against the inequalities women survive. *Please note, at 3 p.m. we will begin our dance portion of the event. Everyone is welcome to join in! Humber/University of Guelph-Humber has been committed to gender-equality and has supported sexual violence survivors over the years, and we hope to showcase that support. For more information, please contact Jennifer Flood at jennifer.flood@humber.ca.